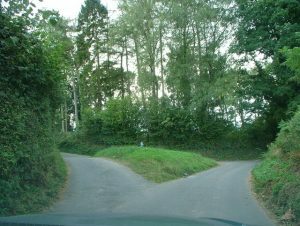 Often in life we find ourselves standing at a fork in the road trying to decide whether to go right, left or stay just where we are. Change can be scary, but it might be more frightening to stay stuck doing the same old thing, especially if it’s hurting us. Sometimes what scares us the most is that we do have a choice. What if we make the wrong decision? We all face making a change at different times in our lives, even me. When Doc brought up the topic of making life choices in group this week, every one was all ears. It’s a topic everyone can relate to. For the most part everyone said they hate change. Doc challenged them to tell her the times in their lives that their choices led to positive things happening. like accepting a promotion or a better job, facing and working through their problems, or going back to school. So how did they decide to move forward and take the risk? Many of them were stumped by how they came to their decisions so we talked about some ways to help when faced with a choice. First of all its good to weigh the pros and cons of a situation. Write them down so you can see them in front of you and then you can make a logical decision. If you’re still not sure, talk to someone that supports you and will give you some good advice. I often ask Doc when I need some advice and even Doc has people that she talks to. Sometimes she even talks to me because I am an excellent listener. It’s good to weigh other’s opinions but ultimately do what’s best for you. Doc often says that our fears can keep us from moving forward if we let them. The funny thing is that most of the time it’s never as bad as we imagine. What if the Wright brother’s had made the choice to stay on the ground instead of trying to fly? We’d all still be driving or taking boats everywhere. Every change in life comes with a choice, it’s up to you to decide whether it’s worth the risk. Once you’ve made the choice, never look back. Trust in yourself and know that you made the best choice you could at the time. You will learn from your experience no matter what happens and isn’t life all about the experiences? Many people think that New Years day is a time for new beginnings, but I think that spring is the time to take stock and start anew. Flowers are blooming, the grass is growing and bunnies are hopping down the trail. 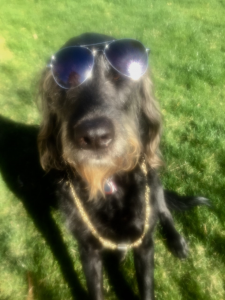 After a long dark winter, the spring temperatures and the sun motivates me to think about what I need to change in my life and the first thing that comes to mind is that I need to retrain some of the humans in my life as they have been slacking off in their duties. When I say slacking off I mean they are getting a little lazy when in comes to meeting my needs. 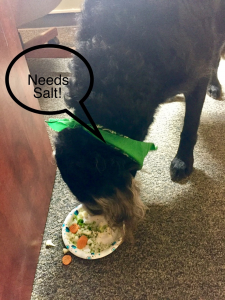 Why just the other day at work my co-worker Kim, that brings me a plate of steamed vegetables every day forgot to put that little dash of salt on them I like for added flavor. I complained by looking at her and whining until she understood and corrected the problem immediately. I don’t think that I should have to spend my time telling humans over and over what I like, so in order to save everyone time I have come up with a plan. The vision came to me when I became exasperated with Doc because I have to remind her almost every day when my dinner time is. Really now, the woman is bright enough to tell time. So I came up with an idea that I think is probably the smartest idea ever. Why not just open a school much like the one Doc took me to when I was a puppy to train me how to sit and stay? You know what I mean, basic obedience for humans where they learn certain commands. Of course only positive reinforcement will be used like earning more time to binge watch favorite shows or more screen time on Facebook or Instagram. Thinking I was a genius, I told my puppy friend Norman that lives next door. I didn’t realize Doc was out working in the flower bed and over heard the whole thing and walked toward me. The look on her face was enough to scare a wild coyote away. Norman was wise enough to run back in into his yard and hide before the wrath came down on me. 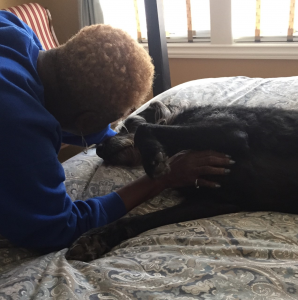 Doc summed it all up in one statement; ” Grover, you are one pampered pooch and you need to learn not only to appreciate all that you have but also all of the humans that love you. No one likes an ingrate.” And with that my goal of controlling the humans in my life vanished. As usual Doc was right so right then and there I vowed to be more appreciative. In everyone’s life there comes a time when we need to move on. It may be to pursue a better opportunity, to leave something negative behind or just to have a fresh start. Whatever the reason, sometimes when one person leaves there is another that is left behind and that is exactly what happened to me. In March after Doc and I got back from our vacation, some of our co-workers had resigned to go to new jobs. One of the people who left happened to be someone that I was very attached to. Doc had tried to explain to me that Carolyn wouldn’t be working with us any more, but somehow it didn’t sink in until I saw her empty office. I just couldn’t fathom that she would leave me behind like that. So every morning I would lay in the doorway of Doc’s office waiting for her to come through the back door and greet me like she had always done and every morning I was disappointed when she didn’t show up. As the days went by disappointment turned into sadness. Doc took notice and began to worry. To add insult to injury, someone else moved into Carolyn’s old office. When I would go by I would saunter in, give the lady occupying the space the “stink eye” and then look under the desk just to make sure Carolyn wasn’t hiding there. Doc and everyone else tried their best to cheer me up but it was no use. Doc even told me that it is normal to feel sad when things change and others move on without us, but I didn’t care, I just wanted to see my friend. One day after we got home from work, Doc took me outside to throw the tennis ball when suddenly she said ” wait here a minute Grover” and she went inside. I watched Doc through the glass sliding door as she let someone in. At first I couldn’t see who it was, but as she got closer I saw it was my Carolyn! As she opened the sliding door I was so happy I jumped up and down and then ran around the yard and the house. When we came inside I gave her big kisses and lay down on the couch beside her. She stayed for about two hours and when it was time to leave she told me not to worry because she would be back to see me. Feeling content I realized I had learned something new…that even though someone you love may move on, it doesn’t mean that they have forgotten you in the process. True friends stay close in their hearts. There is nothing better than a best friend and I am lucky to live next door to mine. 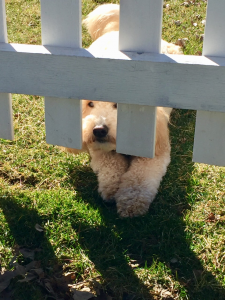 When I see Norman looking under the fence to see if he can come over to play, I do a happy dance. We run around chasing the tennis ball or hang out in the yard and just chill. Doc says she has never seen two dogs that act so joyful when they are together. I told Doc it’s because we can be ourselves when we are together. There is a lot of comfort in someone accepting you for who you are. Doc’s remark about us being so happy got me to thinking about why some of us are happier than others. The answer came sooner than I expected when Doc ran a group counseling session that talked about the very thing I had been thinking about. According to Jaime Kurtz, PhD, happy, joyful people do the following things; They see the world in a positive, hopeful way, they savor small pleasures and experience gratitude, they prioritize their physical and mental health, they have meaningful social relationships, they have rewarding work and hobbies and they experience purpose and meaning in their lives. Luckily I checked all the boxes. I love my life, have a great job working with Doc, good friends, I make sure I exercise, eat right and talk to someone if I am sad or upset. I have many hobbies that include digging holes in the yard and chasing squirrels and at night before I go to sleep I remember to count my many blessings. Now I understand that not everyone has been fortunate enough to have been raised in a positive environment and that can surely have an effect on how you view the world. But here is the good news, you have the power to make some changes, You can start by listing the things that you are grateful for. Since some of Doc’s patients don’t have a stable place to live, every night we remind ourselves that we are thankful for clean sheets and a safe and warm place to sleep. It’s easy to get tunnel vision and only focus on the negative when you are going through a tough time in your life. But the good news is that each of us has the power to make choices that will either make things worse or improve the situation. It’s easy to be lulled into the complacency of our daily routines. There is a certain comfort in predictability. You aren’t really prepared when something jolts you into a new reality, especially in the wee hours of the morning. It started out just like every other day. Doc let me out at about 5:15 am just like she always does. As I was out in the yard doing my business, Doc was inside getting our breakfast ready before work. After awhile Doc came and opened the back door and called for me to come in. As I was meandering up the back steps I stopped right in my tracks when I heard a noise over by the fence. I knew right away something wasn’t right so I turned around. I saw something moving so I immediately went into high alert growling and barking as I ran toward the fence. Doc couldn’t see what I was barking at because it was too dark, but I saw him. There was a man in the yard that didn’t belong there. As I shot through the dark toward the stranger the man became so frightened that he fell right into the weeds trying to get away from me. By this time Doc was aware that we had a trespasser on our hands. I swear Doc doesn’t use the good sense she was born with sometimes. She stood on the back porch watching the man go through the back acre until he reached the street light where she could see him. Later she told me she wanted to get a good description and see where he was headed.Now most normal people would call the police at this point. Not Doc, she said we had to get to work. Luckily one of the police officers we work with told her to go file a report. Duh! After work we drove to the police station and met a nice officer that took our information. Of course I had to go along as I was the main eye-witness. The police asked me what I saw and then asked Doc what she saw. Then the police and the other staff gave me some good belly rubs. One of the officers even asked Doc if he could take me home with him. Of course she told him no. It just so happened that a man fitting the description we gave them had been breaking into cars and had tried to break into woman’s garage that morning. Later that day we got word that they saw him walking down the street and arrested him. Even though that man shouldn’t have been doing what he was doing we both hope he gets the help he needs. Doc told me should couldn’t have been prouder of me. I told her I was happy to protect her, after all we work as a team. Isn’t life is so much better when you know someone has your back? Just when you think you have conquered the life lesson of learning patience, something happens to remind you that you haven’t. I don’t mean to tattle, but Doc is a kind of hurry up and do it now kind of person. Let’s just say patience is not her virtue. I will have to hand it to her though, she realizes that about herself and tries to do better……..but let’s just say she has more work to do than she realizes. On Christmas she received two flower bulbs. One was a paper white (Narcissus) and the other an Amaryllis. She placed both of them in front of the window so that they would get plenty of light. The paper white grew fast and furious and within a few weeks was in full bloom. The Amaryllis bulb, well that was another story. We watched it and watched it for weeks on end until Doc thought it might be dead. Just when she was getting ready to throw it out she noticed that the leaves were starting to get longer. Every day we saw new growth, so she watered it, talked to it and it began to thrive and grow. It took almost 10 weeks, but over the weekend we came home to find that the flowers were starting to open. 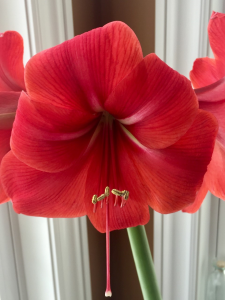 A few days later all of Doc’s nurturing and patience resulted in four big beautiful red blooms. You know there is a lesson in all of this or I wouldn’t have told you this story. But the lesson is not only about the virtues of patience, it is also a metaphor for life. Sometimes the best thing you can do is to sit back, be supportive, nurturing and allow ourselves or someone we care about to grow without judgement. Now that can be hard to do as we all have opinions about how humans should live their lives, including oursleves. But just likes Doc’s flower, if we create an environment that allows growth, beautiful blossoms will eventually appear. 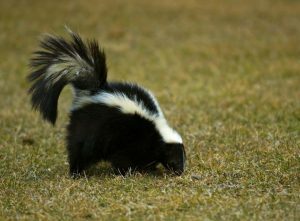 No one informed me that it was skunk mating season, but I should have guessed because I had been smelling what skunks consider their sweet perfume in the air. Let me tell you there is nothing sweet about it, it stinks. But to each his own, who am I to judge? Dogs like to smell each others privates to get in the mood for goodness sakes. But let’s get down to the meat of this story. You may recall that a few years ago I was sprayed in the face by a skunk that wandered under the fence. Did I learn from that experience? I will let you, my faithful readers be the judge. Sunday morning I spotted my neighbor in his back yard with a long string attached to one of his trash cans. I watched as he slowly lowered it down into a window well. He would then pause and slowly try to raise it up. Being the nosy neighbor that I am. I couldn’t figure it out, so I called Doc over so that she could shed some light on the matter. Both of us stood there watching him for quite a while. Doc thought he may be bailing out some standing water due to all the melting snow and rain we have had lately. Soon we got bored and went on about our business. After a while I was walking past the window and saw the trash can sitting in the yard and the neighbor was gone. ” How strange” I though to myself and then I saw the trash can move. Using my super canine vision I spotted a black and white hairy creature moving very slowly like it was stunned. I immediately started barking and growling to notify Doc and everybody else in ear shot that an alien invader was in our midst. ” What on earth is the emergency? ” Doc asked as she ran into the room. I pointed toward the trash can. ” Its a skunk!” she hollered like we were in mortal danger. ” Let me out!” I begged. ” No way”, she said. “Didn’t you learn your lesson the last time you got sprayed? 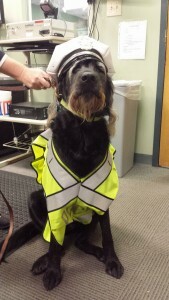 ” There I stood frustrated as I watched the skunk slowly make its way out of the trash can and into the yard. It finally meandered around the side of the house out of sight, but not before it sprayed the side of the house as a warning. Doc tried to distract me from watching TV for the last few days and it didn’t take me long to find out why. She didn’t want me to see that all of the “purebreds” that were competing for the top dog award at Westminster. This has been a long running pain in my gluteus maximus for years now and I find the rules to be the height of dog snobbery. The bottom line, I can’t compete nor can my friends because we are mutts. Now what do you think about that? Maybe Doc is right. 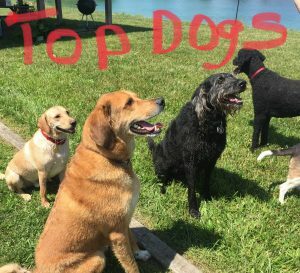 It’s kind of like a beauty pageant for dogs and the rules are set. According to your breed you must have ideal structure, color, perfect ear and tail placement and good temperament. Seeing my disappointment, Doc sat down, looked at me and said, “You know Grover, there are rules for everything. You are certified as a therapy dog and you had to pass those standards. You should be proud of that. Let’s put it this way, many of the dogs that go to Westminster would never be able to pass the therapy dog test. Besides, do you really want a bath and blow out everyday? They also use hair spray on your dog coat to make you look poofy.” ” Oh no!” I said back to her in horror. “You know Doc you’re right. I can just work at being Best in Show as a therapy dog. Every dog and human is good at something. It’s best to focus on your own talents than try to be something you’re not.” ” Now you understand,” Doc said as she gave me a big hug. Tomorrow is February 14, a day that is dedicated to love. Now you would think that everyone would be in favor of a day about love but I have already seen some people on Facebook trashing Valentines Day. What the heck humans! 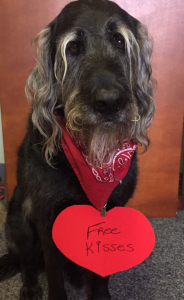 As for myself, I am all about love and to prove it, Doc is going to take me around work tomorrow to give out free kisses and hugs to anyone that needs or wants one. Now doesn’t that sound like more fun than being a hater? Being the inquisitive canine that I am, I got to wondering how Valentines day got started. So I had Doc help me to get on the internet (it’s hard to hit the keys when you don’t have opposable thumbs) so that I could do some research and this is what I found out. Valentine was a Roman Priest during the rule of the emperor Claudius Gothicus. Claudius persecuted the church and prohibited the marriage of young people. He based this on his hypothesis that soldiers would fight better if they were unmarried. Valentine wasn’t having any of that malarkey, so he married couples in secret because he felt that marriage was sacred and should not be prohibited. Of course Valentine was eventually caught and imprisoned. In 269 AD Valentine was sentenced to beating, stoning and decapitation all because he laid his life on the line for what he believed. Valentines martyrdom did not go unnoticed by the citizens in Rome and now he is known as the patron saint of lovers. Not a very romantic story, but it does give you a little more perspective. The day is about more than flowers, candy and romance. It also made me think about love on a deeper level.